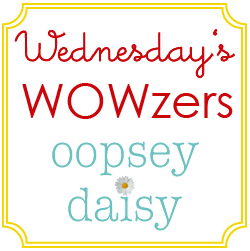 Welcome to another week at oopsey daisy! Our weekend was a whirlwind of excitement as we moved into our very first home. But now the dust is settling, and we are slowly digging ourselves out of the towers of boxes! Luckily I have many more talented guests lined up to help out this week while my craft room is still in boxes. Today, I am thrilled to share sweet Amy with you. Amy blogs at All In a Day. She is super talented, and I adore her photography! 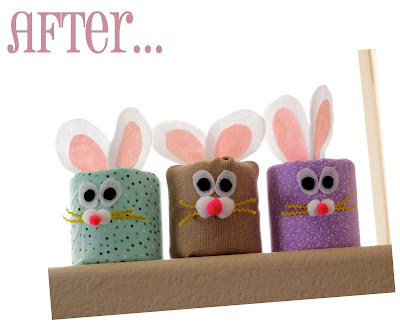 I know you'll love this adorable bunny ceramic spring tray! 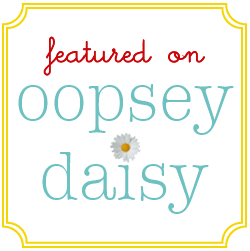 Hey there, Oopsey Daisy readers!! You guys have no idea how excited I am to be here today! I absolutely adore Alison and her blog!! 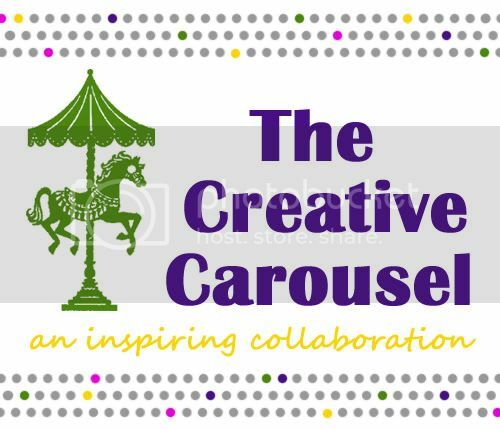 My name is Amy and I blog over at All In A Day! I am the wife to an amazing hubby, the mama to an amazing baby, and a creative spirit who just tries to fit it all in! 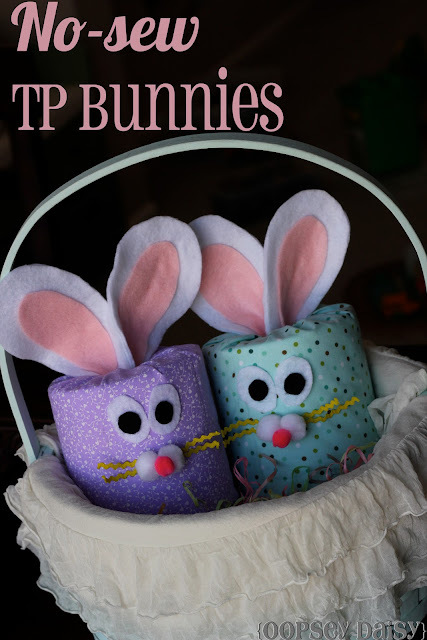 I wanted to share with you a super fun Spring/Easter craft! Ok, so there’s a little background story that goes with this tray. Back in February, I attended the Blissdom blogging conference in Nashville. It was loads of fun and my favorite part was the Opryland Hotel where we stayed (and also where the conference was held). The hotel had the cutest little gift shop. 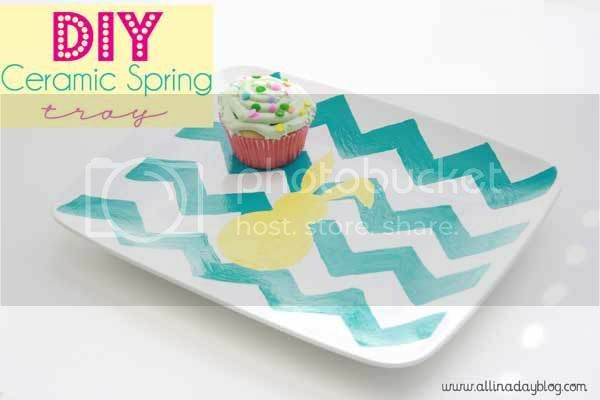 In the gift shop, there was an amazing chevron Spring/Easter platter. It was so stinkin’ cute and I just had to have it!!! I didn’t even look at the price tag. I told myself I would come back and purchase it before the conference was over. Well, wouldn’t you know with all the conference hoopla, I totally forgot to go back and get the platter! RATS! So what’s a DIY gal to do? DUH…..make one of her own!! 1. Make sure your tray is clean. 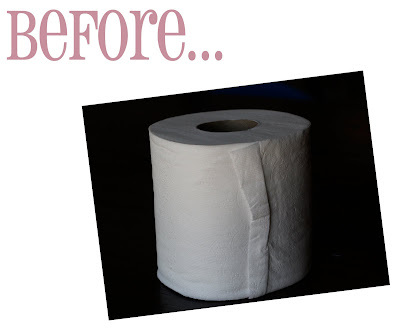 A quick wipe down with a damp paper towel will do the trick! Dry it off. 2. Make your stencils. 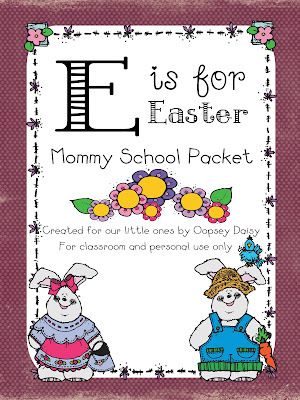 I used my Silhouette cutting machine to make the chevron and bunny. If you don’t have a Silhouette, vinyl (or contact paper) and a craft knife will do the trick as well! My goal was to use the negative space of the chevron as my stencil. But, if I did it that way, I only wound up with 3 chevron stripes and I wanted 4. 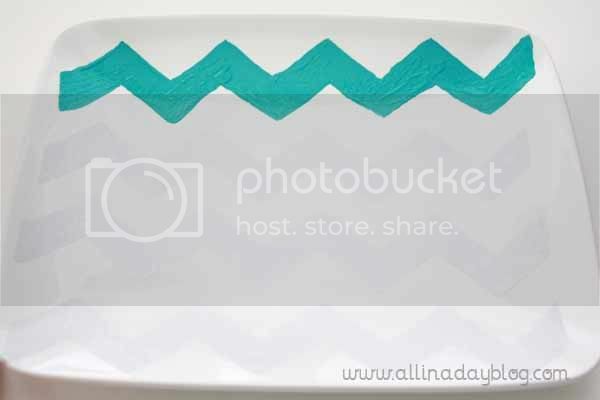 So, I literally peeled up each chevron stripe and traced around it with a pencil on my plate. It worked just fine for me, it just took a little patience. 3. 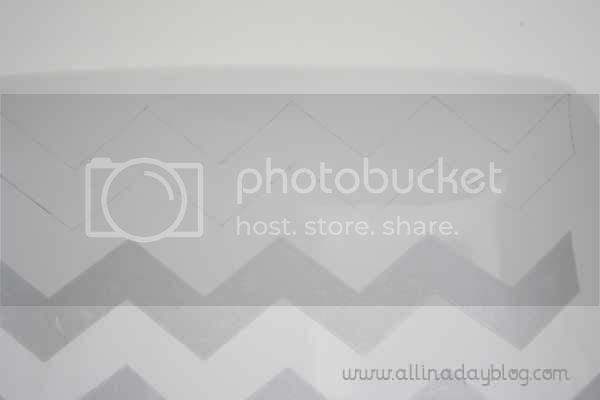 Paint your chevron stripes on. The deal with this enamel paint is that it goes on a little “bubbly”. There will be some bubbles on your plate. Just try to smooth them out as best as you can. 4. Place your plate in a cool oven and heat to 350 degrees. Bake for 30 minutes and allow it to cool in the oven. I simply didn't fight it... This time around, I busted out this holiday shirt with pride! Easter simply wouldn't be Easter without peeps, right?! 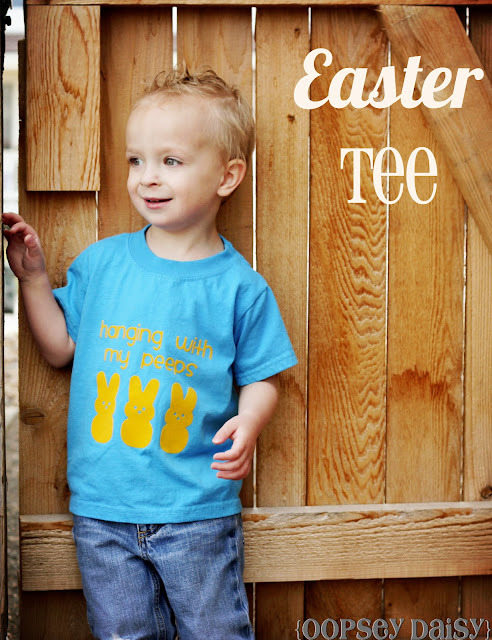 Little Man's Grandpa already introduced him to peeps, so he got excited about his peeps shirt right away. 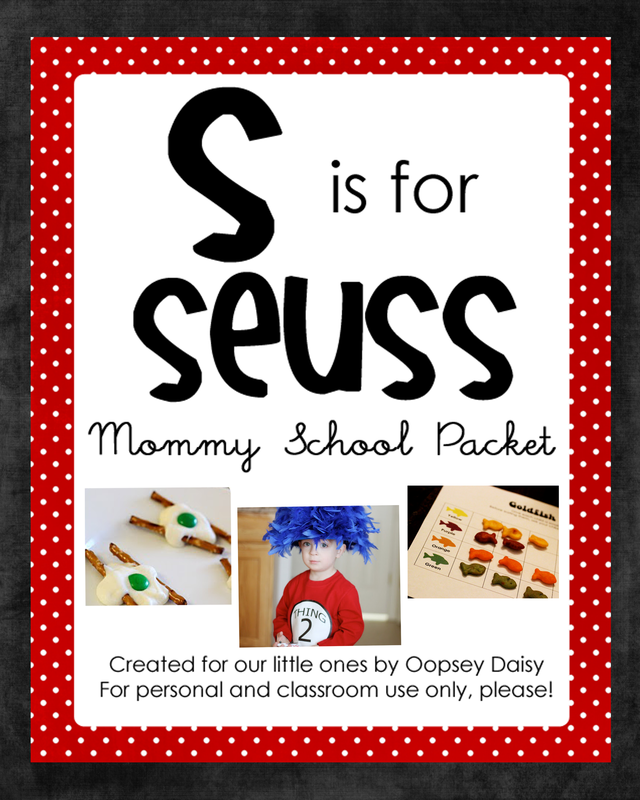 The next Mommy School packet is here! If you've been reading my blog for a while, you know I'm a last minute kind of gal. I wish I was great about planning ahead, but things have been hectic around here. I honestly believed that last week while we were in Arizona, I would work away at this packet during naptimes and in the evenings. (Yeah right!) It took an investment of most of my day today to get this packet ready. But it's done!